Image caption Joel Madden: "I never really had the confidence to lend my voice to any bigger conversations"
After more than 20 years together, pop-punk band Good Charlotte want to use their seventh album to highlight the "darker sides of being human" by tackling issues like religious divisions and the US opioid crisis. Since releasing their first album back in 2000, Good Charlotte have sold millions of records, toured the globe and married some very famous women - vocalist Joel Madden wed Nicole Richie in 2010, while in 2015 his guitarist twin Benji tied the knot with Cameron Diaz. They shot to fame with feelgood hits like Lifestyles of the Rich and Famous and Girls and Boys, but their new release Generation Rx sees them take stock of some pressing issues facing regular Americans, from the opioid epidemic to everyday struggles with mental health. Joel says the band have been through enough in their lives that they now feel confident enough about tackling such subjects. "Everyone in the band has personal experience with this stuff and in some way shape or form it's hard to find someone who hasn't been affected by these things," he explains. "But for us, I feel that we're at an age now where we have some perspective that we can lend to it." At 39, Joel and Benji were born into Generation X. By naming the new album Generation Rx, they are referring to the reliance by some parts of the current generation on prescription drugs - Rx is widely used as an abbreviation for medical prescriptions in the US. "We felt like we could articulate [things] in the songs," Joel says. "We were done with the record and we named it. We thought it was appropriate - it really did sum up the moment." Although the band have not shied away from covering some issues in the past - see anti-suicide song Hold On on 2002's The Young and the Hopeless - this album goes further, Joel says. The death of rapper Lil Peep, who had described the band as one of his biggest influences, particularly affected the group. He was found dead after an overdose of Xanax mixed with fentanyl - a powerful synthetic painkiller - in November 2017. 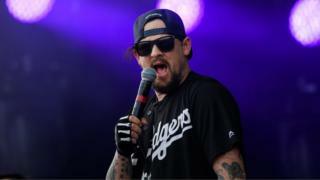 Good Charlotte paid tribute to him by performing a cover of his song Awful Things at a memorial concert, while Joel also paid an emotive tribute to the singer on Instagram. The group started working on Generation Rx this January in their spare time. By day, Benji and Joel run a music company named MDDN in Los Angeles. "We ended up making it over two or three months at our studio. We didn't even have a plan for a record this year," Joel says. The album opens with the haunting eponymous introduction and moves through tracks including the guitar-driven lead single Actual Pain and the emotive piano-based Cold Song. It finishes with the more upbeat California (The Way I Say I Love You), which Joel describes as a "love letter" to his two children. It's also an attempt to end the album up on a "hopeful" note, he says. "It stuck with me and [I thought] if there's going to be a message that I'm going to give up my kids, if you summed all this up and the pain of being a human, is there a positive ending?" The religious undertones of the record are also important to Joel. "I feel like we're living in times where people use religion almost in so many different ways other than what I feel like religion is intended to be, which is based on love and togetherness and humans taking care of one another," he says. "We've never really gone there, it's new territory for us." The song Prayers captures that dismay at religious divisions, and the fact that prayers to make the world a better place never seem to be answered. "None of this makes sense in this reality/God just leaves the room when I turn on my TV," Joel sings. It is "liberating" to tackle these subjects, he says. "I don't really say a whole lot about things sometimes, so it does feel great to express yourself and give your view of what you see. "I never really had the confidence to lend my voice to any bigger conversations - usually I stay out of everything. "Ultimately, I think it can be taken the wrong way. I wasn't saying prayers are useless, I'm questioning if we're all living what we say, are we all acting on our words?" With the band now more confident about speaking out, they headlined a benefit concert in Annapolis, Maryland, in July for the five staff killed at the town's newspaper, the Capital Gazette. Although the band now live in California, Joel says he considers Annapolis his home town and it's where his family members still live. "I know those streets, I can see the place and I can feel the place, so when that tragedy happened, it really hit home and we were all pretty stunned," he says. "It was really incredible to see a town come together to stand behind the members of their community and the families of the people at the Gazette and the paper itself and ultimately take care of their own and stand up for something." Generation Rx is being supported by a tour that ends at London's Alexandra Palace next year, the band's biggest ever UK headlining show. Joel says the band have big plans to make the show more experience-based and interactive. "We want to open the show so it feels like the record's coming to life," he says. "If you go to a movie or a play, you're in it for those two hours, it feels like when you leave, you went there and really had an experience. So I want it to be more experiential like that than just going and watching a band play." The themes on Generation Rx mean the band can "really bring it to life live", he says, but ultimately he hopes the record is thought provoking. "I don't know if we're setting out to jump into the middle of any conversations right now or change the world," he says. "I'm not sure what we're trying to accomplish on a bigger level, but I believe there's a ripple effect and if we can have a positive effect on a few people in our world, then I think that does affect the greater purpose and greater good. "We want to ask questions, we want to encourage people to ask themselves, we want to encourage people to reflect on themselves and how they deal with their pain and how they look at each other." Generation Rx is out on 14 September through MDDN/BMG. Good Charlotte play Alexandra Palace on 20 February 2019.